Some people have Life Lists. Some people have Bucket Lists. We have a Things That We Would Regret Not Having Done If We Ever Moved Away From Austin, Not That We Are Planning To Do So, List. The list includes things like going to Gruene Hall, visiting the Dr Pepper Museum in Waco and going to the Broken Spoke. 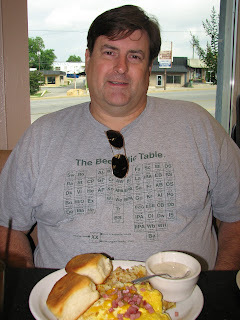 Today we crossed one of the things off our list – eating breakfast at the Blue Bonnet Cafe in Marble Falls. The Blue Bonnet Cafe is a Texas legend, having been in business for more than 75 years. Texas Highways magazine voted the Blue Bonnet the #1 breakfast place in Texas and one of the top 10 restaurants in Texas. To be honest, I hadn’t heard about the Blue Bonnet until about six months ago when my colleague, Mike McBride, told me about it. It took several months to convince Doug to go (and actually putting it on our list) and then a month to find a day when we were up early enough and didn’t have a lot of things on our to do list to go. Today was the morning. From our house it was about a 70 minute drive on twisting, hill country roads. Wouldn’t have been so bad if I hadn’t imbibed a little too much at Robert & Tracy’s wedding last night and if our convertible didn’t have such a rough ride. Still, the drive is pretty. We got there about 8:30 and while busy, we got a seat right away. It was a friendly, bustling place. It’s cash and checks only, but they do have an ATM. The portions were definitely Texas-sized. We both got omelets, which come with either grits or hashbrowns (we got hashbrowns) and your choice of bread. Let me recommend the Texas-toast. It’s easily an inch and a half thick of homemade bread. It was so yummy that we bought a loaf to take home. 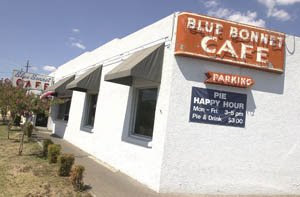 The Blue Bonnet is also famous for its pies. We didn’t have room for dessert, but we bought a pecan pie to take home. 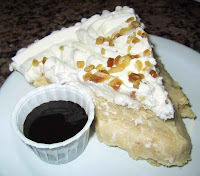 Some of the pies, like the peanut butter pie pictured below, look out of this world, but we wanted something that would easily transport back to Austin. We must have arrived at a good time because by the time we left, the line for seating snaked down the long entry way and out the front door. The Blue Bonnet Cafe is worth the trip. As Doug said when we were leaving, this is a place we’ll cross off our list many more times. I'd like to think that I inspired this post with our chat about our "Things I Must Do" lists. I have friends with a vacation house in Marble Falls and we can't visit without stopping at the Bluebonnet. Yummo!